Worry is like a scarecrow in that it is an empty threat designed to scare you away from something valuable. Just behind the scarecrow lies rows and rows of fresh delicious corn. But crows are frightened by something that isn't even real. They generally ask a lot of 'what if' questions of the scarecrow. "What if it shoots us?" "What if it grabs us from mid air and pummels us slowly to death?" 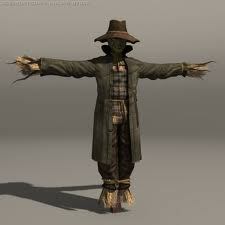 "What if..." "What if..." "What if..."
The scarecrow has been placed perfectly to divert the crows from the very best. Just beyond our worry is God's greatest plans for us. But worry frightens us. My worry, something completely empty and unfounded, keeps me asking paralyzing 'what if' questions. "What if said bad thing ends up happening?" "What if said bad thing happens...again?" "What if some ridiculous growing unreasonable fear happens to me?" "What if..." What if..." "What if..."
The worry is placed in my heart to divert my attention from God's very best for me. There are so many good things I could go after and experience in my life, but I'm terrified of the straw man named 'Worry'. I may never experience those good things that lay just beyond. What if the crows only had a brain and each time they saw a scarecrow, they started to say, "there must be something good right there."